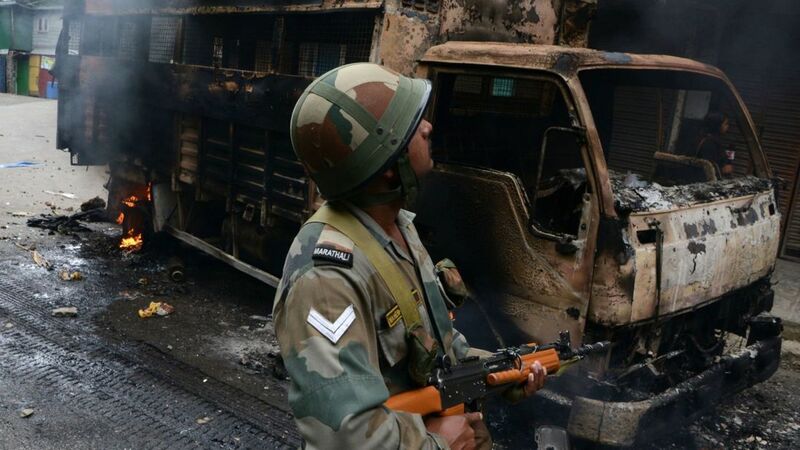 A man has died and scores of police were injured during rioting in the Indian resort of Darjeeling. The violence has escalated in recent days and erupted in large-scale rioting on Saturday in the hill resort at the peak of the tourist season. Almost 50 people, mostly police, were injured in riots and arson attacks which have been taking place for more than a week, forcing many visitors to leave. The unrest intensified on Saturday and a man died as cars were torched and police were attacked by mobs with knives. Officers responded with teargas and baton charges in an attempt to control the situation. The director general of West Bengal state police, Anuj Sharma, said: "A man was killed and at least 35 policemen were injured yesterday. Some of them were stabbed in the back." He said one officer who intervened in an arson attack was "seriously wounded after protesters slashed his throat". Mr Sharma said the dead man appeared to have been shot but the circumstances were still unclear. Police have denied using live ammunition.